This trip will be the first chance I’ve had to hunt with my youngest son. He will be the trigger man. We are leaving out tonight and will be hunting in the morning. Will post as much as I can depending on service. Here are a couple of our targets. Good luck young man. Hope you get a bruiser. Good luck to y'all... some very nice deer! Thanks guys, about to leave work in about 30 min to pick the boy up from school. Safe travels and good luck to the young man. Tuned in and good luck to y’all. Good luck in the morning. Good luck. Those are some mature deer. Have a great hunt. Made it to the lease and got unpacked. Gonna be nice cold morning. Good luck to those hunting this weekend. Getting ready to go get in the blind. 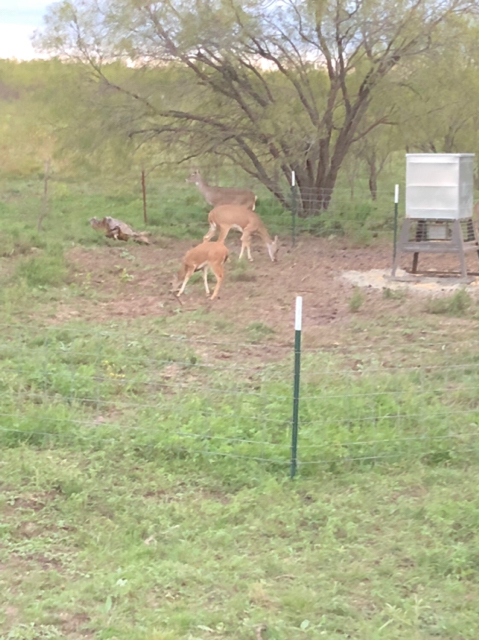 We had 6 does come out and one went to stomping and blowing and they all took off! She might be in trouble in the am! Here is our view for this afternoon. We are gonna hunt my bow blind. Good luck this morning, hope your boy gets a big one. Hope one of your target bucks makes a mistake this morning. Good luck! Later in morning but he was not wanting to. I wanted him to enjoy the time so I didn’t force it.